This information is designed for use by union reps. If you are an apprentice, see our How much do apprentices get paid? in our information and resources for apprentices. In the history of the union movement's support for Apprenticeships, a founding principle has been that an apprentice should be paid a wage for doing a job, albeit one involving extensive periods of education and training. There are clear legal, moral and business reasons for employers to pay apprentices a decent wage. The Apprenticeship Pay Survey 2014 found that across Level 2 and 3 apprentices in Great Britain, the mean total weekly earnings was £257 (median: £238): this includes basic pay plus paid overtime, tips from customers and bonuses. Weekly earnings above the average for Level 2 and 3 apprentices were also found among male apprentices (£275; median: £250) and those aged 25 or above (£315; median: £290). As their skills develop, apprentices' pay should increase accordingly. They may get additional money for essential books, clothing or equipment. Apprentices should also receive the same benefits as other employees such as pension contributions and subsidised canteen and leisure facilities. Those under the age of 19 or in the first 12 months of their training are currently entitled to an Apprenticeship National Minimum Wage, which is set by the Low Pay Commission on an annual basis. The current rate is £3.30 per hour as of October 2015 (this rate is for apprentices aged 16 to 18 and those aged 19 or over who are in their first year. All other apprentices are entitled to the National Minimum Wage for their age). This will rise to £3.40 from October 2016. You can find more information about the apprenticeship wage on the GOV.UK website. The government apprenticeship website can also help young people to find an apprenticeship. Apprentices should be paid for time spent training off the job as well as the time they spend in the workplace. The new minimum wage entitlement for apprentices will also cover Wales, Northern Ireland and Scotland. The apprentice who is paid a fair wage is more likely to complete their apprenticeship and stay on with their employer afterwards. Apprentice rates should reflect the job done – if an apprentice does a full job they should be paid for it, or quickly progress to that point. Are there loans for apprentices? 24+ Advanced Learning Loans (now called Advanced Learner Loans) were introduced in August 2013. 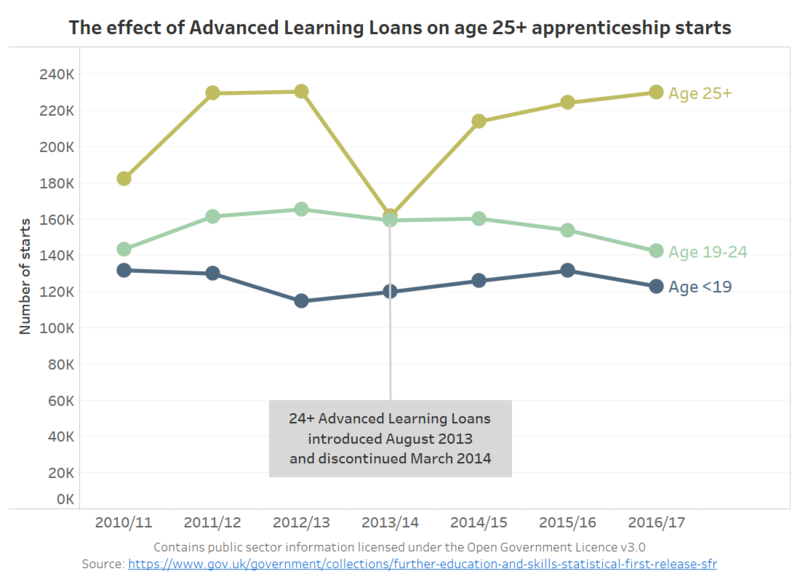 Take-up of loans for non-apprenticeship study was close to government expectations. However, take-up among apprentices was poor. The introduction of the loans had a significant and negative impact on the number of new apprenticeship starts. In response, the UK government announced that adult apprentices were no longer required to take 24+ Advanced Learning Loans. In March 2014, it was announced that apprentices who had taken the loan would have it written off.